The TTS Global Initiative was launched in 2007, emerging out of a working group of the heads of the leading trade lobbies and associations in Europe for Biotechnology, Pharma, Bio Industry, Venture Capital, and key European institutions. All of these stakeholder groups sought to undertake a new initiative to foster the more efficient translation of leading biotech and healthcare sector research to the market and to patients. The first Summit was held in Barcelona that same year and laid the foundations for the development of the leading global platform for decision makers and recognized leaders from all critical stakeholder groups involved in bringing the benefits of world-class biotechnology and healthcare to both the market and patients for the benefit of society. Our central goal is to act as a think-tank to foster better understanding between all the stakeholders in the Biotechnology community on the critical need for efficient translation of early innovative research to commercialisable product technology. TTS serves as the platform for and un-matched environment for fostering increased and improved biotech innovation, translation, licensing, partnering and business development, ensuring that the true potential of world-class research is achieved. Vice Presidents, Deans, Chancellors, and Directors of Research from public and private research institutes, universities and clinics. CEOs, Managing Directors, Directors and managers from technology transfer, translation, licensing and commercialization offices. The TTS Global Initiative is the leading international platform and community of its kind, bringing together key representatives of all crucial stakeholder groups in the entire value chain of bringing world-class translational research and innovative to patients and markets. 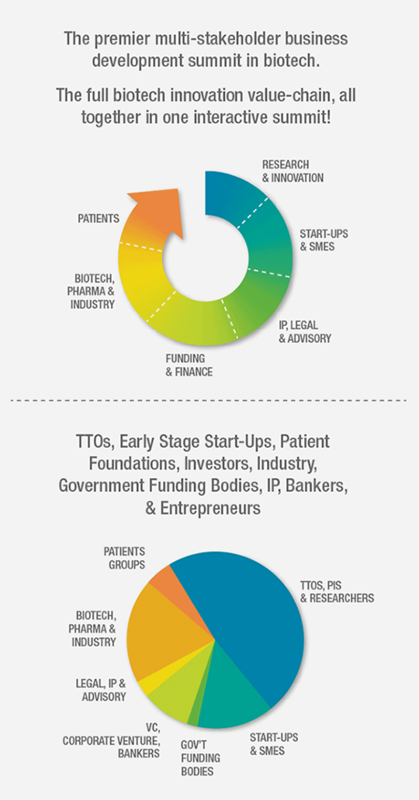 Operating across Europe, North America, Australia, and Latin America, the TTS is a unique initiative and a powerful global network of leaders in the translational biotech innovation ecosystems.